When I had the restaurant, we used this recipe instead of plain mayonnaise for lots of things. You loved it then, as I’m sure you would now. Low fat or lite mayonnaise will fine for this. I prefer and highly recommend Duke’s brand from an old southern family recipe and family run business. Besides being family run, they make a darn good mayonnaise. 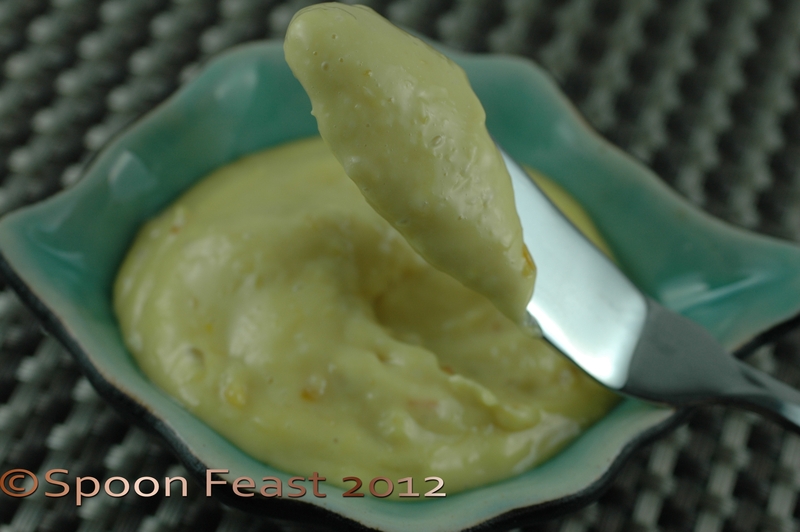 Here is how to turn Saffron Aioli into one great condiment that flavors everything very well. Use it anywhere you would mayonnaise. Saffron is the stamen of the crocus flower. The best quality comes from Spain and all stamen are hand-picked. It is one of the worlds most expensive spices. Saffron is coveted for the lovely yellow color and the exotic scent and flavor it contributes to the dishes wherever used. I’ll do a post on Saffron later. Aioli refers to garlic flavored mayonnaise. However, a true Aioli is crushed garlic with olive oil. Some recipes ask for an egg yolk to assist with the emulsification of oil and garlic. Making it correctly is hard and the mixture is temperamental. 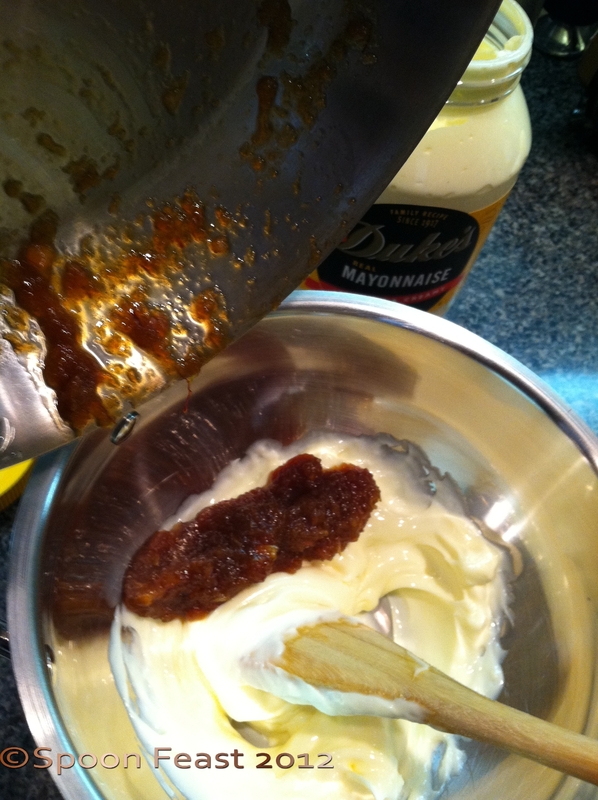 It takes a long time to make real aioli which is why mayonnaise has become a common substitute. Yes, we will use mayonnaise in this recipe. 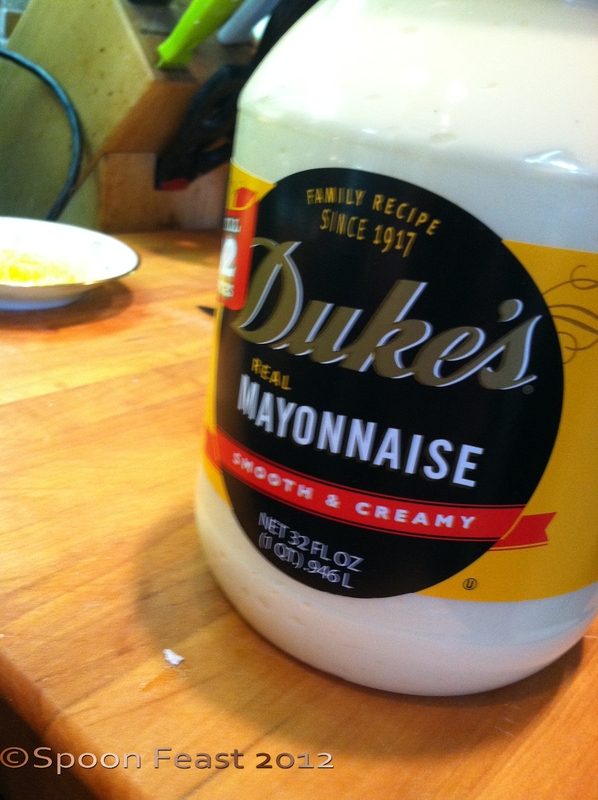 1 cup mayonnaise of your choice – I prefer Dukes. Just don’t pick “miracle whip”! 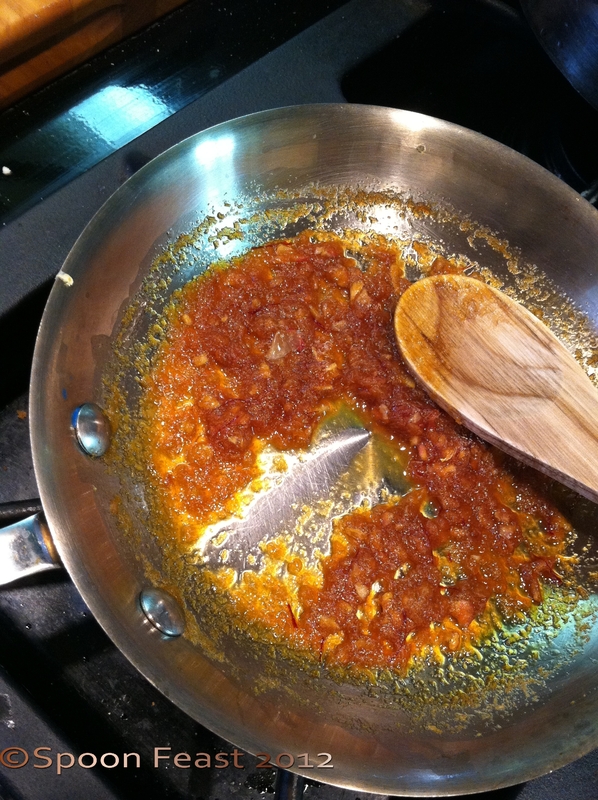 Add the vinegar, honey, saffron, shallots and garlic to a small saute pan. Cook the mixture down until it remains separated when a spoon is drawn through the mixture on the bottom of the pan as shown. Stir it in thoroughly. 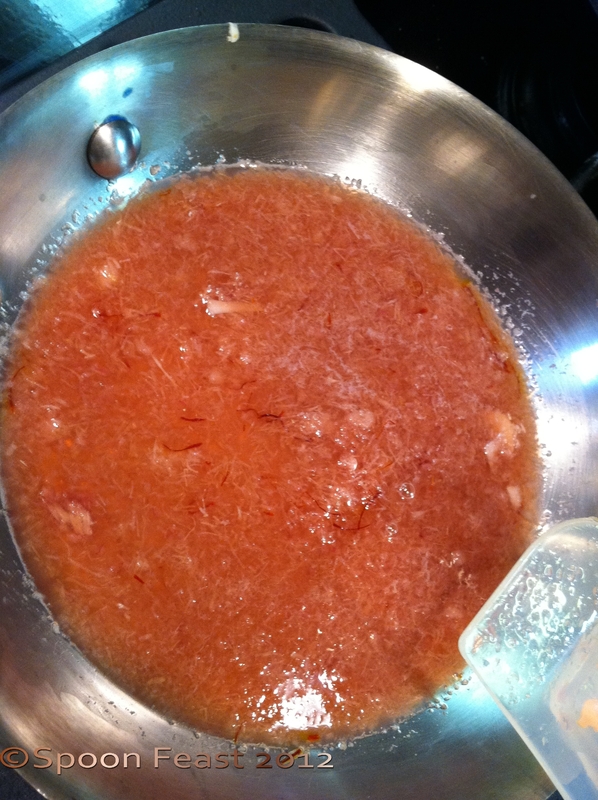 The longer the saffron sits in the mixture, the more color will dissipate. Stir it in before using to evenly distribute the flavor and color. Store this Saffron Aioli in the refrigerator and use within a month. Use the expiration date of the mayonnaise used as your guide. As the aioli sits, it will become more yellow. Stir the color in so there is uniform color and saffron flavor. You can use this as a dressing for steamed vegetables like broccoli, carrots, and asparagus. Yes, you can leave out the shallots, but you have eaten them and liked them. Make Saffron Aioli in small batches so it is fresh. I’d like to know if you remember the flavor when you taste it! BTW: You can purchase a small amount of Saffron in local stores. The quantity you buy is so small it is usually packed in small bags or vials inside much larger packages to deter theft. Why theft? Because it is pricy and very small. I sent you some in a small plastic bag and inside a small mason jar. (The smallest one!) Keep it in a dark cabinet away from the heat of the stove, top of fridge or dishwasher. It will last a long time, if you keep it sealed and in the dark. When you use it, you only need a small pinch. Just a a few stamens, 5or 6 are enough for a cup of aioli. 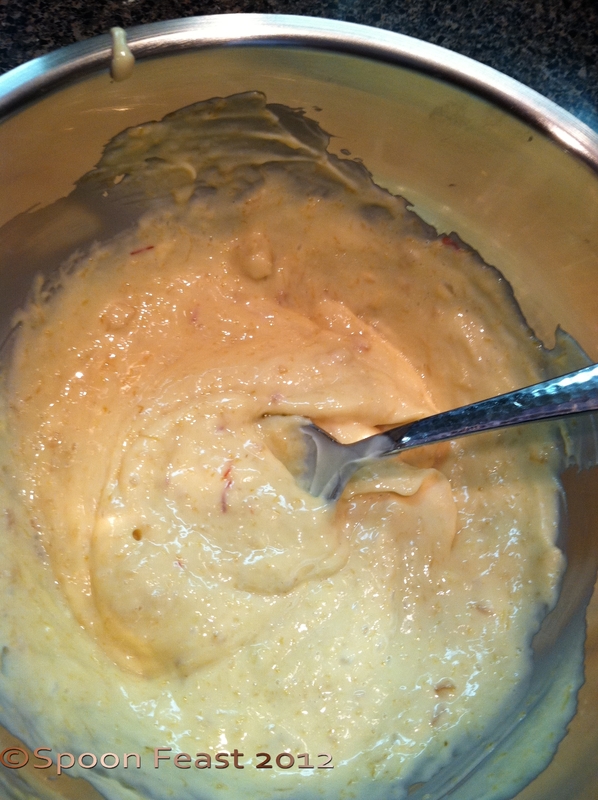 This entry was posted in Recipes and tagged Aioli, food, Garlic, Mayonnaise, Olive oil, red wine vinegar, Spain, Tablespoon. Bookmark the permalink. OMG – what great flavors. Yes Indeedy! Try it for dipping steamed artichoke leaves. Another OMG moment.